dagurval abandoned D2341: Enforce NULLDUMMY. dagurval updated the diff for D2341: Enforce NULLDUMMY. New approach. Instead of modifing the existing nulldummy test, create a new test following deadalnix's test plan above. dagurval abandoned D2508: [tests] nulldummy cleanup. According to telegram discussion, this change is controversial and needs to be split into 7 diffs. Mark Lundeberg <36528214+markblundeberg@users.noreply.github.com> committed rABC31427f585a5c: Bump automatic replay protection to Nov 2019 upgrade (authored by dagurval). dagurval closed D2376: Bump automatic replay protection to Nov 2019 upgrade. dagurval updated the diff for D2508: [tests] nulldummy cleanup. dagurval added a comment to D2508: [tests] nulldummy cleanup. This diff suffer from the classic syndrome of doing several things at once, causing discussion about one of these things to delay progress and all the others and everybody getting frustrated. dagurval added inline comments to D2508: [tests] nulldummy cleanup. dagurval added a comment to D2431: [tests] Activate 'great wall' in the past. ftr, this was abandoned because other devs found it more or equally important to test for incompatibilites without 'great wall' upgrades enforced. Herald added a reviewer for D2508: [tests] nulldummy cleanup: deadalnix. dagurval added inline comments to D2341: Enforce NULLDUMMY. dagurval abandoned D2431: [tests] Activate 'great wall' in the past. dagurval added a comment to D2444: Refactor comments in feature_nulldummy.py. dagurval abandoned D2437: qa: Temporarily disable test that reads the default datadir location. What changes do you want @jasonbcox? dagurval added a comment to D2437: qa: Temporarily disable test that reads the default datadir location. Turns out the failure in D2431 was unrelated to this. I'm happy to close this unlanded. dagurval updated the diff for D2431: [tests] Activate 'great wall' in the past. This fixes test failure for me in D2431. The symptom locally was that bitcoind was unable to get a lock on a file in my ~/.bitcoin folder. Herald added a reviewer for D2437: qa: Temporarily disable test that reads the default datadir location: deadalnix. Herald added a reviewer for D2431: [tests] Activate 'great wall' in the past: deadalnix. dagurval updated the summary of D2341: Enforce NULLDUMMY. Update after prerequisite todo items have landed. Cleanup and rebase. dagurval committed rABC1fcc2a0a4cb0: Add function 'IsGreatWallEnabled' (authored by dagurval). dagurval closed D2375: Add function 'IsGreatWallEnabled'. dagurval updated the diff for D2375: Add function 'IsGreatWallEnabled'. dagurval added inline comments to D2375: Add function 'IsGreatWallEnabled'. dagurval committed rABC07fa32b405c2: [tests] Fix tx padding (authored by dagurval). dagurval closed D2374: [tests] Fix tx padding. Herald added a reviewer for D2376: Bump automatic replay protection to Nov 2019 upgrade: deadalnix. Herald added a reviewer for D2375: Add function 'IsGreatWallEnabled': deadalnix. dagurval added a comment to D2374: [tests] Fix tx padding. Herald added a reviewer for D2374: [tests] Fix tx padding: deadalnix. dagurval committed rSTAGINGf6c8a4ef792e: Do not make it trivial for inbound peers to generate log entries (authored by Matt Corallo <git@bluematt.me>). Herald added a reviewer for D2341: Enforce NULLDUMMY: deadalnix. dagurval committed rABCf6c8a4ef792e: Do not make it trivial for inbound peers to generate log entries (authored by Matt Corallo <git@bluematt.me>). dagurval closed D2323: Do not make it trivial for inbound peers to generate log entries. dagurval updated the diff for D2323: Do not make it trivial for inbound peers to generate log entries. dagurval updated the summary of D2323: Do not make it trivial for inbound peers to generate log entries. Herald added a reviewer for D2323: Do not make it trivial for inbound peers to generate log entries: deadalnix. dagurval accepted D1148: Make dates explicit and fix erroneous comments. dagurval accepted D1146: Make sure compact blocks work when there are more than 65536 transactions in a block. LGTM. The equivalent in XT is in PR https://github.com/bitcoinxt/bitcoinxt/pull/344. dagurval accepted D967: Allow test cases to be skipped. dagurval accepted D964: Control mempool persistence using a command line parameter..
dagurval accepted D966: Python functional tests should log in UTC. dagurval added inline comments to D967: Allow test cases to be skipped. dagurval accepted D954: Backport the getchaintxstatsrpc RPC. LGTM. A couple of nits. You forgot attribution. dagurval accepted D947: [qt] Stop treating coinbase outputs differently: show them at 1conf. dagurval accepted D945: Fix importwallet edge case rescan bug. dagurval accepted D948: Remove redundant parameter params of EncodeDestination. dagurval accepted D903: test: Report InitBlockIndex result. dagurval accepted D801: Use user configured encoding in receive request. dagurval updated the diff for D583: Support parsing cashaddr from command line. dagurval committed rABCa38bff37c337: Introduce bitcoinUriScheme (authored by dagurval). dagurval closed D797: Introduce bitcoinUriScheme. Added a warning if two (or more) addresses from incompatible networks are parsed. dagurval requested review of D801: Use user configured encoding in receive request. dagurval updated the diff for D797: Introduce bitcoinUriScheme. dagurval added inline comments to D797: Introduce bitcoinUriScheme. dagurval committed rABCe52fa6d72dd2: Add missing include in receiverequestdialog (authored by dagurval). dagurval closed D806: Add missing include in receiverequestdialog. dagurval closed T130: Revision D802 broke builds as Resolved by committing rABCe52fa6d72dd2: Add missing include in receiverequestdialog. dagurval created D806: Add missing include in receiverequestdialog. dagurval added a revision to T130: Revision D802 broke builds: D806: Add missing include in receiverequestdialog. 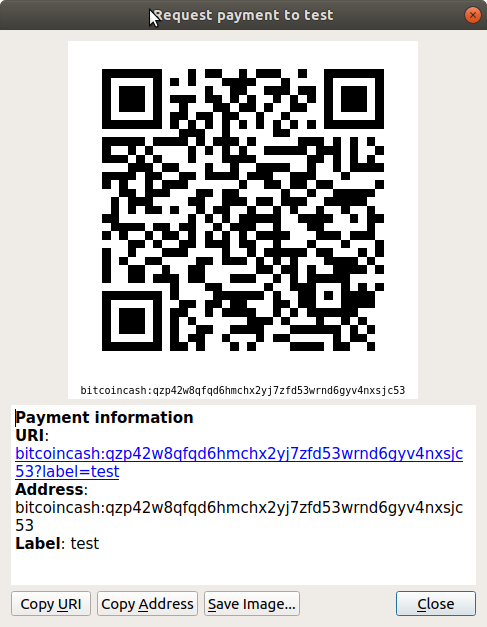 dagurval committed rABC87b604444cc5: Modify QR code to fit cashaddr (authored by dagurval). dagurval closed D802: Modify QR code to fit cashaddr. dagurval requested review of D797: Introduce bitcoinUriScheme. dagurval added a reviewer for D802: Modify QR code to fit cashaddr: Restricted Project. dagurval added a reviewer for D801: Use user configured encoding in receive request: Restricted Project. dagurval added a comment to D802: Modify QR code to fit cashaddr. 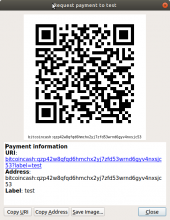 dagurval created D802: Modify QR code to fit cashaddr. dagurval created D801: Use user configured encoding in receive request. dagurval updated the test plan for D583: Support parsing cashaddr from command line. Parts of this were split out into D797 and D769. Rebased on top. dagurval created D797: Introduce bitcoinUriScheme. dagurval committed rABCa492b58df9f5: Accept multiple schemes in parseBitcoinURI (authored by dagurval). dagurval closed D769: Accept multiple schemes in parseBitcoinURI. dagurval added a comment to D761: Encode cashaddr size properly in version bit..
Looks good. You need a test to ensure PackCashAddrContent throws when it should. Herald added a reviewer for D769: Accept multiple schemes in parseBitcoinURI: Restricted Project. dagurval committed rABC68daecd4edba: Encode destination using Base58 in WalletDB (authored by dagurval). dagurval closed D745: Encode destination using Base58 in WalletDB. dagurval updated the diff for D745: Encode destination using Base58 in WalletDB. dagurval added inline comments to D745: Encode destination using Base58 in WalletDB. dagurval accepted D764: Remove needless import. dagurval committed rABC9350110492c6: Support cashaddr in parse/format URI (authored by dagurval). dagurval closed D709: Support cashaddr in parse/format URI.